Last year Lauren and I came back from Closing the Gap pretty fired up and ready to make some big changes at our school! When I first started there in April 2014, I immediately gave some trainings about core language and its important role in AAC. 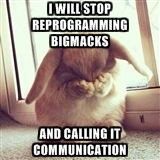 Our biggest challenge was trying to get people to stop re-recording BIGmacks and 8 Cell devices! But… it’s hard to make changes! And getting people on board with core (and AAC in general) was happening at a pretty slow rate! Shortly after we came back, Lauren found Kate Ahern’s picture version of the Communication Bill of Rights. We immediately posted it and started referring to it in trainings! We’re still making changes, slowly, but they’re happening! You can check out the original document from ASHA here! It’s hard to pick a favorite since they are all important! But here are the few that I love to remind people about! 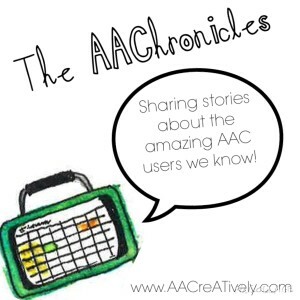 Here is the first post in our new series AAChronicles! We will be sharing a story about an AAC user we know every Friday. We know a fantastic 21 year old who started a trial with Core Scanner a few weeks ago. When her mom came in to school for a Thanksgiving event, her daughter said “hello” to her! For years she was limited to a single switch with re-recorded messages. I am upset that it took this long to get her an appropriate communication system, but excited to see her finally share her voice. Click here for More information about Core Scanner! Music can be a great motivator, especially for students with visual impairments. Amanda and I have been creating simple music activities in Classroom Suite that provide students with the ability to choose what music they want to listen to while working on switch scanning. For some of these students, this is also an opportunity to find out what their musical preferences are. I have made a few “mixtapes” that include R&B, classical, pop, country, and rock. We quickly discovered each student’s preferences (Pharrell’s “Happy” wins hands down for almost everybody). After showing one of these “mixtapes” to a parent, she was excited to attach switches to her daughter’s headboard for her to choose the classical music she wanted to listen to before bed. Here is an example of a Taylor Swift “mixtape” made for one of our older students. Recently, I made a template for teachers and therapists to make their own “mixtapes”. i thought I would share the template and directions on the blog as well. Continue reading for the downloadable template and directions. In the spirt of Thanksgiving, here are the top five AT products we are thankful for! 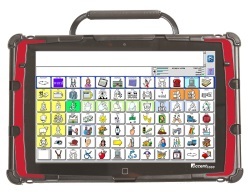 Language Based AAC Systems – Of course those made it to the top of the list! We are so grateful to see our students using devices like the Accent 1000 with Unity 84 Sequenced, Spanish Unity, or CoreScanner; the iPad with the LAMP WFL app; and the Tobii I Series. TAP-it – We first saw the TAP-it at Closing the Gap in 2014 and have been thankful ever since! 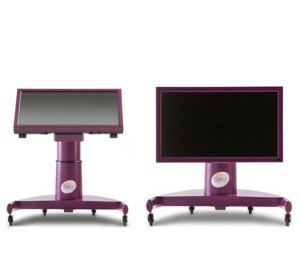 It’s an adjustable touch accessible learning platform that differentiates between unintentional and intentional touch! 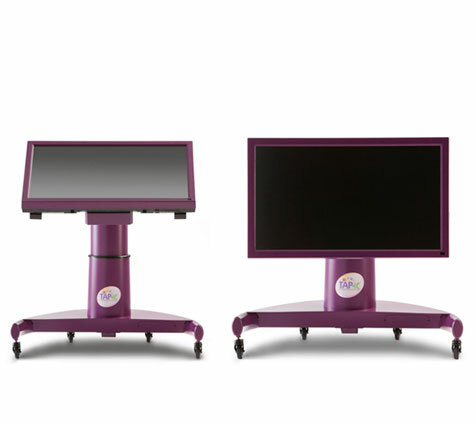 Because it is adjustable (height and angle), has a military grade screen, and is on wheels; it has been an amazing asset at our school. 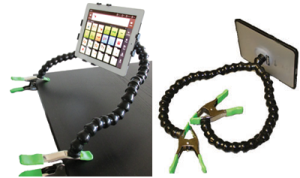 It allows students with severe physical disabilities to access a touchscreen they would otherwise be unable to reach! 3. 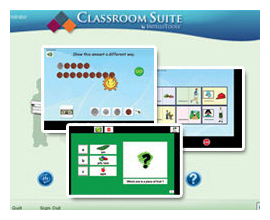 Classroom Suite – A great way to make switch accessible activities for your students. We have had a great time making and using switch accessible books! We’re also thankful for this alternative pencil for our students with severe motor issues. 4. Loc-Line – We love this budget-friendly way to mount our AAC systems and switches! 5. Boardmaker with Speaking Dynamically Pro – What SLP isn’t thankful for Boardmaker?! It’s the go-to for making print based materials with picture supports and with Speaking Dynamically Pro you can make awesome interactive materials! What AT products are you thankful for? I have been making simple song choice activities in Classroom Suite this week. We have several students with vision impairments who are learning to switch scan and really enjoy these music activities. Today, a student played the Kidz Bop video of the song “Chicken Noodle Soup” on repeat after Amanda told him she really did not like the song. Each activity only contains a 20 second clip of the songs (typically the chorus). My best friends when cutting music and video to make these have been Online MP3Cutter and Online Video Cutter. Continue reading to find out more about each website. Someone on the team identifies that the student needs an AAC system. The team meets and decides on a system. The SLP trains the classroom on how to use the device. A couple months goes by, maybe a little longer, and someone sends out that dreaded email. Getting an AAC system for a student is just the first step! Once we’ve identified a language based AAC system with a robust vocabulary, we need to start teaching the student how to use it! Here are my top five points I ask teams to consider when they raise this question. Has the team (teachers, SLP, classroom staff) been provided with sufficient training on how to use the system? Have you modeled enough?! It’s essential to remember that input comes before output. If you haven’t sufficiently modeled on the device, you can’t expect the student to have magically learned how to use it! Do you provide the student with many opportunities throughout the day to communicate? Communication should occur naturally throughout the day. Stop and take advantage of these opportunities or create them! Do you honor the student’s communication attempts? For example, if the student asked for “drink” did you take him to get a drink? It’s our job to make communication with AAC powerful. Honor those requests whenever possible and if it’s not possible, acknowledge the student and let them know when that request will be available! While researching information about literacy instruction for students with CCN, I discovered a set of video and learning guides on http://www.engagingalllearners.ca/. The videos feature Dr. Caroline Musselwhite and include brief discussions about various ways teachers can further develop their literacy instruction. I have already shared the video on Symbols and Learning to Read with several teachers at our school. Please share this resource with anyone providing literacy instruction to a child with complex communication needs. “Core vocabulary is not going to work for this student” is something I hear all the time. At this point, I’ve mostly learned to tune it out and continue pushing for my students to have an AAC system with a robust vocabulary which includes CORE language. But every now and then, my anger over this statement reaches a certain point and I just have to let loose! So here it goes to all the behavior specialists, teachers, administrators, and therapists out there who continue to use this statement. I’ll let one of my students prove you wrong! My other favorite variation is: “Core words just don’t apply to learners with complex communication needs.” Say this to my students. I dare you. Guess what? 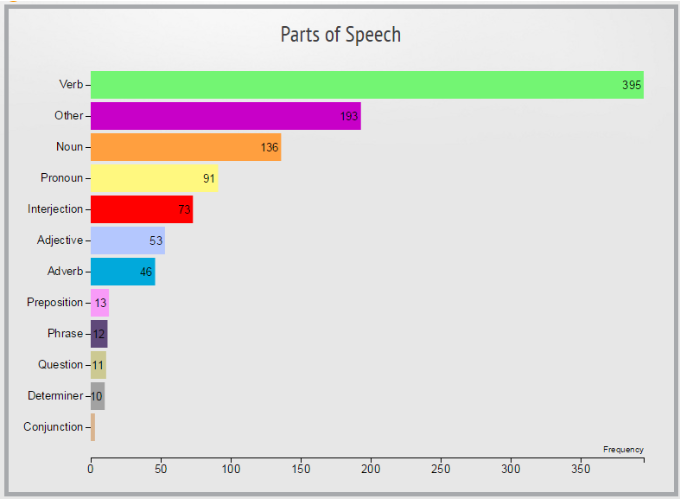 Noun vocabulary accounted for only 13.17% of his speech. The nouns + other, which included names of his family, teachers, and friends, accounted for a total of 31.85% of his speech. 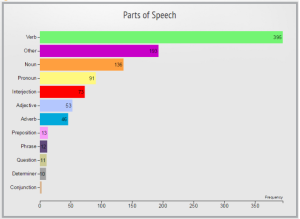 Pre-stored phrases accounted for 1.15% of his speech. That means 67% of his speech was comprised of CORE words! So the next time someone tells you a student can’t use core language because of their complex communication needs, think of my student, and continue advocating for yours! Equipped with a M.A.T in Special Education is for k-12 students who access the general education curriculum, I began my teaching career in a classroom of 11 students with autism, multiple disabilities, and intellectual disabilities in a special education school (not exactly what my 5 years of higher education focused on). Unfortunately, the extent of my exposure to AAC in college was limited and I went into the field without the knowledge I needed to teach my students. My first few years teaching were full of reprogrammable BIGmacks, 2 cells, and 8 cells. Hours were spent making “communication” books full of picture symbols that were not organized and went missing constantly. At one point, I was given an iPad with TouchChat for a student and spent hours programming the pages in a way that made sense to me. There were so many amazing students with complex communication needs that I failed to provide with appropriate language instruction and communication systems. 2 years ago, I went to a mandatory after-school training run by our new AT Specialist (Amanda- the other half of AACreATively) and heard the words CORE LANGUAGE for the first time (afterwards I felt a lot like the ashamed bunny in the meme above). Since that training, I have learned so much about AAC that I wish I had known as a first year teacher. Communicate regularly with your classroom SLP (I promise they don’t bite)! Become knowledgable about communication and language development. Ask questions,co-plan/teach activities, request trainings on individual student systems, go to trainings/conferences or watch webinars together, and share your knowledge and experience. Finding an appropriate communication system is the most important thing you can do for your students. You can’t teach effectively if your students can’t communicate. Make this a priority! OT and PT can provide valuable insight when choosing a communication system and determining access. Ask questions and learn from them. Speak up if you disagree with a choice the rest of the team is making (before the IEP meeting). Not every therapy provider is up-to-date on what is best practice. It is up to you to question something you are unsure about and ask for further explanation. Presume Competence! You have a classroom of students who will blow you away with what they can do if you provide them with the opportunity. Find your AAC heros on the internet! Presuming competence and advocating for your students can feel lonely and isolating at times. There are some amazing professionals, parents, and AAC users out there that can make you feel like part of a communication revolution. 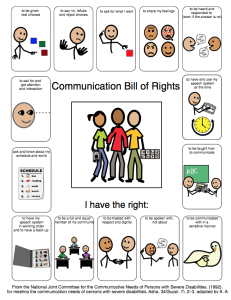 Read and re-read ASHA’s Communication Bill of Rights. Search for professional development opportunities outside of school inservice days. Going to the AAC Language Seminar Series provided me with the tools I needed to speak knowledgeably about Core Words and AAC. Tell everyone what you have learned. Most new teachers have very little AAC knowledge. Share the wealth! Believe in yourself! Believe in your students! Don’t let the high-tech haters get you down. Now go forth and provide students with the tools to communicate!